Iran (the Islamic Republic of Iran) is a country in southwestern Asia (the Middle East region). It shares land borders with Afghanistan, Armenia, Azerbaijan, Iraq, Pakistan, Turkey, and Turkmenisten. Iran has sea coasts on the Persian Gulf, the Gulf of Oman, and the Caspian Sea, the last of these being an inland sea. As of 2009, the population of Iran was estimated as 74,196,000. 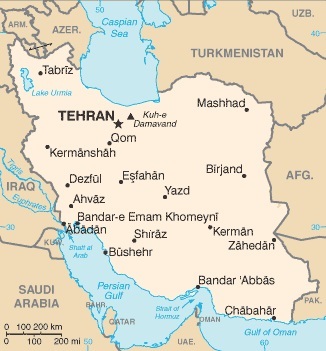 The capital, and largest city of the country is Teheran, which has a population of about 8 million. The Iranian economy is based around a combination of state ownership and central planning of larger enterprises (including oil), as well as smaller private ventures, and village agriculture. The service sector is the largest sector of the economy, and industry the second largest, and oil and gas accounts for about 45% of government revenues. In recent years, the government of Iran has been introduced more market-orientated reforms (including attempting to privatize many government owned manufacturing concerns), as well attempting to diversify the economy away from oil. Lonely Planet Iran is your passport to the most relevant, up-to-date advice on what to see and skip, and what hidden discoveries await you. Hike among the Castles of the Assassins in Alamut Valley, Lose yourself in Esfahan's historic bazaar, or ski in the Alborz Mountains; all with your trusted travel companion. Get to the heart of Iran and begin your journey now! The Perfect Choice: Lonely Planet Iran, our most comprehensive guide to Iran, is perfect for both exploring top sights and taking roads less travelled. Looking for more extensive coverage? Check out Lonely Planet Middle East guide. Iran is rarely out of the headlines, and there is likely to be a rush of interest from tourists and investors if the provisional framework agreement reached in April 2015 is implemented, lifting most sanctions in exchange for limits on its nuclear program for at least ten years. Western fascination with Iran is nothing new. For centuries, foreigners have been entranced by a country that is quite distinct from all others in the region. Iran is home to one of the world’s oldest civilizations. Travelers have long been seduced by the echoes of the extraordinary ancient history contained in the word “Persia.” But Iran is also a modern society that is experiencing great change. Although it is still feeling the effects of the Islamic Revolution of 1979, social restrictions have loosened considerably in recent years. Strict Islamic rules coexist with an increasingly dynamic society driven by an overwhelmingly young population. Animosity toward the West at a political level sits side-by-side with a wholehearted welcome for foreigners as individuals. Culture Smart! Iran takes you beyond the clichés to show how life in Iran really is and how you can feel comfortable in its society. It offers insights into a country full of surprises. Despite Iran’s deep commitment to Islam, the pre-Islamic Zoroastrian past is still part of everyday culture. Its language, Farsi, shares linguistic roots with English and French. It is a country where one of the more genuine democracies in the Middle East is overlaid by an unelected theocracy. And where “no thank you” really does sometimes mean “yes please.” If nothing else, this entrancing, beautiful, and sometimes infuriating place is a country whose inhabitants genuinely wish visitors Khosh amadi!—Welcome! Iran, or Persia as it was formerly known, has been of interest to outsiders for millennia. From the Greco-Persian wars of antiquity, through the rise and flourishing of Islam, to the age of European imperialist expansion in the East, Iran has been a central player in global history. Drawn by its strategic location along the Silk Road, ancient and distinctive culture and abundant natural resources, foreign diplomats, traders and travelers have been coming to Iran for centuries. The Islamic Revolution of 1979 and subsequent events put a strain on Iran’s relationship with the outside world, particularly the West, leading to sanctions and a decline in tourism and trade. Yet early in 2016 the Lausanne Accord over Iran’s nuclear program, and then national elections resulting in greater reformist representation in Iran’s Parliament have greatly increased the country’s attractiveness to outsiders, with travelers and business people once more setting their sights on Iran. Lonely Planet Iran is your passport to all the most relevant and up-to-date advice on what to see, what to skip, and what hidden discoveries await you. Experience the lavishly decorated Ali Qapu Palace, explore the covered bazaars of Yazd, or try a variety of Iranian kababs; all with your trusted travel companion. Get to the heart of Iran and begin your journey now! The Perfect Choice: Lonely Planet Iran, our most comprehensive guide to Iran, is perfect for those planning to both explore the top sights and take the road less travelled. Looking for more extensive coverage? Check out Lonely Planet's Middle East guide for a comprehensive look at all the region has to offer. Authors: Written and researched by Lonely Planet, Andrew Burke, Virginia Maxwell, and Iain Shearer.